Nathan Barontini's Blog: Real Men Don't Cry? A Biblical Reflection from the Words of Pope Francis. Real Men Don't Cry? A Biblical Reflection from the Words of Pope Francis. which immediately brought to mind the oft-heard "real men don't cry." Which, in turn, brought to mind the realest of all "real men" (in fact we are only men as dim reflections of His Divine "cosmic" masculinity) - the man Christ Jesus and the most powerful two word sentence ever crafted, "Jesus wept." (John 11:35). "If we don't learn how to cry, we can't be good Christians." Something to ponder. Do you, good reader, know how to cry? Do I? If we don't do we really love our neighbor as commanded by the Lord (cf. Mk 12:31)? "This is challenge." Indeed, Holy Father it is. It is a reminder of the core calling of our Christian, of our Catholic, identity. "See how the Christians love one another" was the cry that launched the conversion of the Roman world (a world not exactly know for love - slavery, gladiatorial combat, infanticide, lust, greed, pride...). Is that what people say when they see you or I or our Catholic brothers in the world? They should. We (and we alone) share the full faith of those first Christians. We are nourished by the Body and Blood of Christ. We even have the witness of the Vicar of Christ, which continues to call out the challenge to holiness 21 centuries after God first transformed the world by stepping into His creation. "Don't be frightened of crying. "Here we hear an immediate echo of the recurring theme from the sonata that was the pontificate of Saint John Paul the Great, "Be not afraid," which was itself an echoing, by Christ's Vicar, of God's own words, "Jesus spoke unto them, saying: Be of good cheer, it is I, be not afraid." (Matt 14:27), which recalls the words God spoke through Isaiah to His chosen ones seven centuries before, "fear thou not, for I am with thee; be not dismayed, for I am thy God." (Is 41:10). 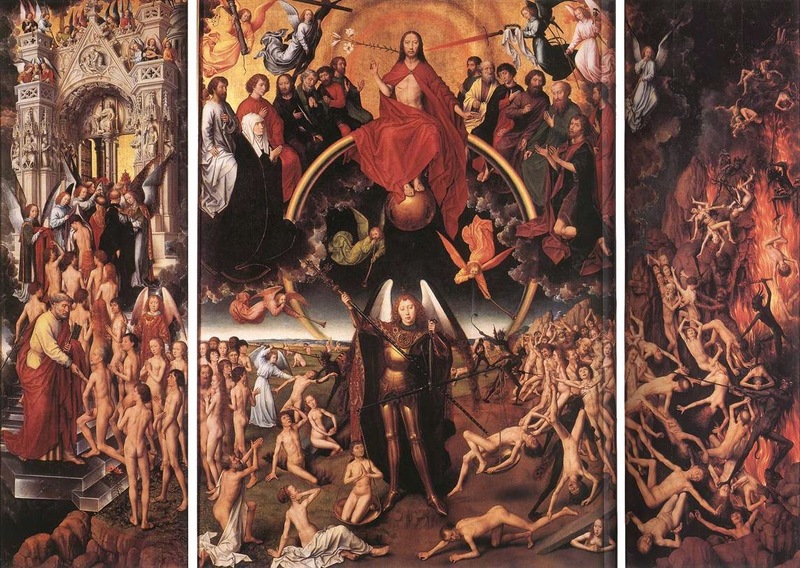 We need fear not the looks or thoughts of a cruel and prideful world, "fear ye not them that kill the body, and are not able to kill the soul...", but only to fear God whose justice is always perfect, "...but rather fear him who can destroy both body and soul in hell" (Matt 10:28). Which brings us right back to the dies irae. 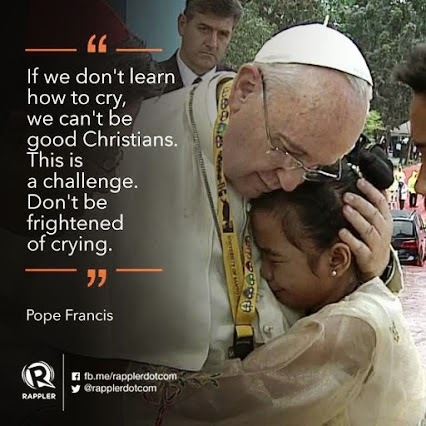 In some very real sense, then, we can say, building on the words of our Holy Father and of the Scriptures we looked at, that we can cry with our brethren in this "vale of tears" or we can cry for eternity with damned in hell. "If we don't learn how to cry, we can't be good Christians. This is challenge. Don't be frightened of crying. "Profound words from His Holiness. The two year old in all of us knows how to cry. It appears that worldwide boys are taught to suppress their tears at an early age. The loss of crying for sadness and empathy cuts off the tears for joy and happiness. Unless you are willing to give the 'two year old' more say joy and happiness are limited. I learned to ride a bicycle at a young age. I don't hve to relearn how ever again. Crying is exactly the same. May you experience tears of gladness and joy often. They are warm and salty.